With its standard 110 kV/290 mA DC testing, up to 50 kV ARM prelocation and 3 kV to 50 kV surging with up to 2500 J, the R 30 System covers all requirements in the range of low voltage up to high voltage without any difficulty. Optional the system offers a 0.1 Hz cosine rectangular test system up to 70 kVrms and testable cable capacity of 5 µF @ 0,1 Hz, Burning with 15 kV / 25 A and surging with 80 kV and 3200 J. For higher voltage the R 30 system can be optionally equipped with up to 400 kV DC and 400 kV Decay. All operational modes are controlled by a central system control panel which selects the operation via motor driven HV switches. 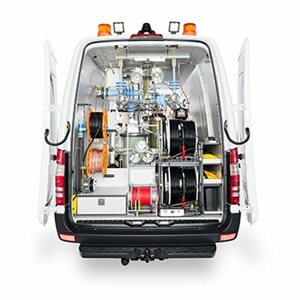 Like all Megger products, the R 30 includes an extensive safety system, which provides the maximum safety for operator, personal and equipment during the operation of the system.